In Kerala, it's getting increasingly difficult to hire labour to pluck coconuts. The main reason is that it is very risky. I read somewhere that falls from coconut trees are the single biggest cause of spinal injuries in Kerala. For some time now government agencies have been trying to develop a machine to make coconut plucking easier and safer, with varying degrees of success. The photograph below shows a new machine for the purpose. Strictly speaking it's not a machine but an attachment. 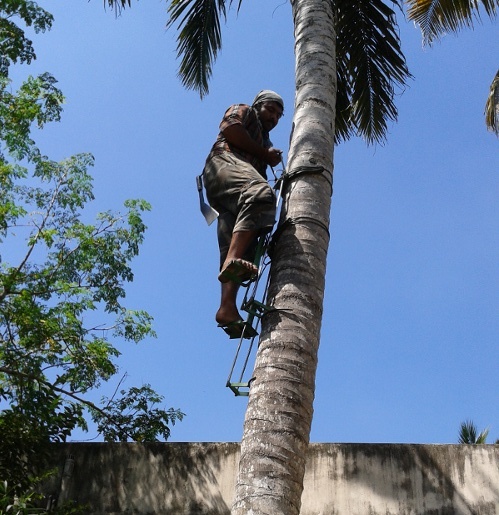 Using it the coconut plucker can climb a tree as easily as if he were walking on a road, except that in this case the road is vertical. The cost of the device is Rs 2,500. The link below lists coconut climbers in Trivandrum using the new device along with their telephone numbers. The person in the photograph is R. Sreejith.